FSM Board: PR: LAIR AND UNKNOWN KNOWN PLUS 20% OFF SALE! General Discussion: PR: LAIR AND UNKNOWN KNOWN PLUS 20% OFF SALE! We've got the fever bad in La-La Land and we're spreading the love to our customers with an unbeatable 20% OFF SALE! That's right, we'll take 20% OFF YOUR ENTIRE ORDER! Simply place your online order and 20% of your total price will be automatically deducted at checkout. (NOTE: This offer applies only to titles currently in stock). Sale starts 4/8 at 12noon (PST) and runs through 4/21 (11:59pm PST). ACK! ACK! GOING OF OF PRINT ALERT: MARS ATTACKS! is going out of print 4/30. Get yours now! LOW STOCK ALERT: Less than 150 units remain of BLACK RAIN and less than 250 units remain of HOOK. Once they are gone, our Limited Edition run of these titles will be completely sold out! La-La Land Records and Sony Computer Entertainment America proudly present the CD premiere of John Debney’s (JOBS, PREDATORS, PASSION OF THE CHRIST, THE RELIC) astonishing original score to the 2007 videogame LAIR. Debney’s blockbuster score to this epic-adventure-fantasy game is considered to be among the finest music ever written for the medium. It’s an orchestral powerhouse that reaches the same rarified heights as such beloved fantasy film scores as CONAN THE BARBARIAN, WILLOW and THE LORD OF THE RINGS TRILOGY. Now, finally, LAIR gets the deluxe treatment it has always warranted. 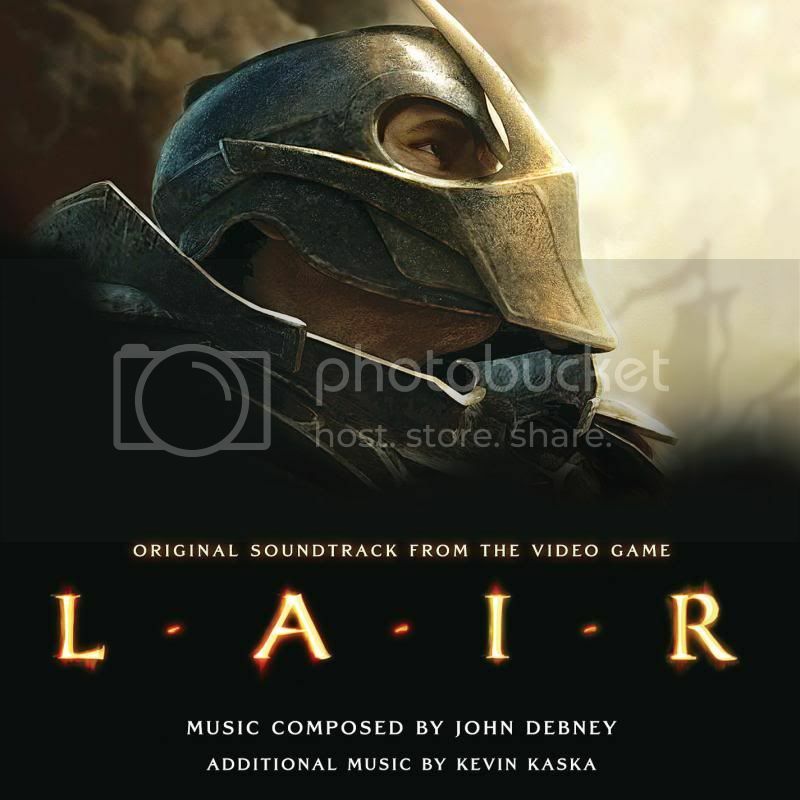 Remastered and expanded beyond its initial download-only release, this jam-packed 2-CD presentation of LAIR, produced by John Debney and Dan Goldwasser, and mastered by Marc Senasac at Sony PlayStation, even includes the live concert suite performed by the The Orchestra Filarmonia and Ziryab Choir at the BSO Spirit Awards. Exclusive in-depth liner notes by Jeff Bond complement the adventurous art design by Dan Goldwasser. This is a limited edition of 2000 Units. This title is also available for download from online digital music retailers. Washington D.C.. Produced by Danny Elfman and mastered by Patricia Sullivan this release showcases another notable work from one of contemporary filmdom’s most talented and celebrated composers. Art direction is by Dan Goldwasser. This album is also available for digital download at online digital music retailers. La-La Land Records and Taurus Entertainment present the restored, remixed and expanded re-issue of composer John Harrison’s (EFFECTS, DAY OF THE DEAD) iconic original score to the 1982 horror classic CREEPSHOW, starring Hal Holbrook, Adrienne Barbeau and Leslie Nielsen, written by Stephen King and directed by George A. Romero. Long out-of-print and one of La-La Land’s earliest, best-selling releases, CREEPSHOW returns in an all-new limited edition supervised by the composer, re-sequenced in film order and remixed from original 24 track elements. One of the most beloved and influential horror scores of 80’s horror, Mr. Harrison’s CREEPSHOW now sounds better than ever! Complimenting this assembly are exciting BONUS TRACKS, showcasing several never-before-released and long-sought-after library cues featured in the film, including the song “Don’t Let Go” from the movie’s “Father’s Day” segment. Produced by John Harrison and Ford A. Thaxton, and mastered by James Nelson, this limited edition of 3000 Units includes new and exclusive, in-depth liner notes from film music writer Jeff Bond, composer John Harrison and director George A. Romero. Delightfully creepy art design from Mark Banning ties all the macabre fun together. La-La Land Records and 20th Century Fox present the remastered re-issue of Tangerine Dream’s (SORCERER, THE KEEP, LEGEND, MIRACLE MILE) original score to the 1983 motion picture sci-fi drama WAVELENGTH, starring Robert Carradine, Cherie Currie and Keenan Wynn, and directed by Mike Gray. Electronic musical geniuses Tangerine Dream find the inner-pulse of this overlooked cult gem about a pair of lovers who attempt to rescue innocent, child-like aliens held captive in a secret government installation and help return them to their world. This striking score manages moments of sublime beauty and poetry, even spirituality, while also supporting the film’s quotient of menace and suspense. Previously out-of-print, WAVELENGTH returns in this handsome re-issue sounding better than ever. Produced by Nick Redman and Ford A. Thaxton and remastered by James Nelson, this limited edition of 1500 units also features in-depth, exclusive liners from writer Randall D. Larson and otherworldly art design by Mark Banning. La-La Land Records, WEA and Warner Bros. presents the latest release in its Expanded Archival Collection, the 2-CD remastered and expanded re-issue of renowned composer Don Davis’ (BOUND, THE MATRIX, THE MATRIX RELOADED) original score to the 2003 conclusion of the famed sci-fi/action THE MATRIX trilogy, THE MATRIX REVOLUTIONS, starring Keanu Reeves, Laurence Fishburne and Carrie-Anne Moss, and directed by The Wachowski Siblings. Composer Davis closes out one of the most notable sci-fi trilogies in all of filmdom with an astounding original score that is a stunning culmination of his breathtaking MATRIX masterworks. Expanded over two discs, with a running time of over two full hours, this presentation of MATRIX REVOLUTIONS, produced by Dan Goldwasser and mastered by Mike Matessino, contains music recorded for, but ultimately unused, in the final film, as well as bonus alternate cues. Film music journalist Tim Greiving takes the listener down the rabbit hole with his exclusive, in-depth liners while Dan Goldwasser’s sharp art design recalls THE MATRIX universe with style. This is a limited edition of 3000 Units. La-La Land Records and 20th Century Fox present the restored and remastered re-issue of legendary composer Jerry Goldsmith’s (PATTON, THE OMEN, ALIEN, FIRST KNIGHT) original score to the 1966 Twentieth Century Fox WWI war drama THE BLUE MAX, starring George Peppard, James Mason and Ursula Andress, and directed by John Guillermin. Goldsmith’s powerful masterpiece comes roaring back to life in this knockout presentation. Meticulously restored by Mike Matessino and remastered by Daniel Hersch from original stereo elements, this high-flying re-issue produced by Nick Redman and Neil S. Bulk features the intended film score on Disc One, and the first-time-ever CD debut of the original LP program on Disc Two, along with bonus tracks that include previously unreleased source music. Liner notes from film music writer Julie Kirgo and track-by-track analysis by writer Jeff Bond round out stellar art design by Jim Titus. A must for all film music enthusiasts! This is a limited edition of 2000 units. La-La Land Records and Paramount Pictures present the remastered and expanded release of Shirley Walker & John Carpenter’s score to the 1996 Paramount Pictures futuristic actioner ESCAPE FROM L.A., starring Kurt Russell, Steve Buscemi and Cliff Robertson, and directed by John Carpenter. When it came time to score his big-budget follow-up to the cult classic ESCAPE FROM N.Y., director/co-writer John Carpenter, who had inventively scored most of his films (HALLOWEEN, THE FOG, BIG TROUBLE IN LITTLE CHINA), collaborated with the ingenious Shirley Walker (BATMAN: THE ANIMATED SERIES, BATMAN MASK OF THE PHANTASM, WILLARD) to create the perfect musical soundscape for the further exploits of Snake Plissken. Building upon Carpenter’s iconic synth template, Walker harness her trademark orchestral power and the result is a full-charging heroic score that takes Plissken to new action-packed heights. Produced by Dan Goldwasser and mastered by Doug Schwartz, this expanded release boasts a running time of more than 78 minutes and contains cues that were recorded for the film, but never used. Film music writer Daniel Schweiger brings the listener behind the movie and its score with his in-depth liners and the sharp art direction is courtesy of Dan Goldwasser. This is limited edition of 1500 Units. La-La Land Records and MGM present the remastered re-issue of renowned composer Basil Poledouris’ (CONAN THE BARBARIAN, ROBOCOP, THE HUNT FOR RED OCTOBER) original motion picture score to the 1985 medieval-set action/drama FLESH + BLOOD, starring Rutger Hauer, Jennifer Jason Leigh and Jack Thompson, and directed by Paul Verhoeven. Considered to be one of his best works, Poledouris’ bold score continues in his CONAN tradition – and it’s an absolute powerhouse! Essentially, a release for those who weren’t fortunate enough to obtain it previously, this re-issue produced by Ford A. Thaxton and remastered by James Nelson, is a must-have for any film music enthusiast who missed out on grabbing it. Film music writer Randall Larson eschews re-counting ground already covered extensively in previous editions of the soundtrack and instead focuses on an interview he and David Kraft conducted with Poledouris, in the composer’s home, on May 19, 1985. To our knowledge, this is the only detailed, contemporary interview Poledouris gave on this score and much of this lengthy conversation had remained unpublished… until now. Majestic art direction by Mark Banning rounds out this exciting presentation. This is a Limited Edition of 1200 Units. looks like the unknown known sound samples might need a little help. some spirited airplane music going on! I think that's Elfman's action scoring for the footage of drone attacks in the documentary. TRUE GRIT is "TEMPORARILY OUT OF STOCK". Could you say when this one will be available again? Or: Will it be in stock again before the sale ends? So does the sale include the two new releases? I am super pumped for the Unknown Known. I was really looking forward to Glass' Visitors score as I am a big fan of the Qatsi scores. Visitors was a real disappointment, but the Unknown Known sounds like it's going to satisfy my craving for a good Glassian documentary score. Elfman's S.O.P. is also pretty great. Definitely nice to see Elfman breaking away from the animated fare and stretching himself. Just saying, this is a good chance for anyone still on the fence to finally take the leap for the LETHAL WEAPON box set. Just saying. Lair ordered (how long have I wanted to be able to say that), along with Gunfight and Sum of All Fears. Too bad but no deal-breaker. Thanks for the quick reply! I've been waiting for Lair for years, and with the sale it was too good of an opportunity to pick up some other miscellany I'd skipped thus far. Thanks, LLL! Man, I've been reading all of this critical acclaim for Lair, and listening to the samples now I know why! When Debney is allow to unleash his full creative potential, beautiful music follows. I'm gonna have to grab this, and probably while it's on sale too. Right now I am savoring those samples. Lair is nothing short of fraking epic! BTW there are no bad tracks. It's all gorgeous and majestic. The acclaim and the samples have definitely sold me. These are the types of scores I love. Hmmm... just did... awww my poor credit card! Need to get at least 2 more orders in before the sale is over. I thought autographed copies of LAIR were unavailable? Your description here says they are available.